Roxey Mouldings have been producing model railway kits since 1972. All our model train kits contain assembly instructions with drawings. 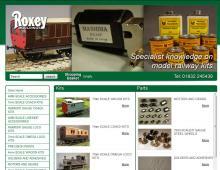 Roxey Mouldings supply model railway locomotives, carriages and wagons in 4mm, 7mm and narrow gauge. The online shop also stocks everything you'll need to complete your model railway kit such as motors, gears, wheels, solder and paint. Contact Roxey Moulding for further information or order your model train kits online now.